24-page fuly-illustrated how-to's. Get this booklet when re-weaving a porch rocker type in plain-weave with 1/4" Wide Binding Cane or narrow flat reeds. Click on chair image to see pattern weave. 24-page New England Porch Weave Booklet, illustrated how-to's. 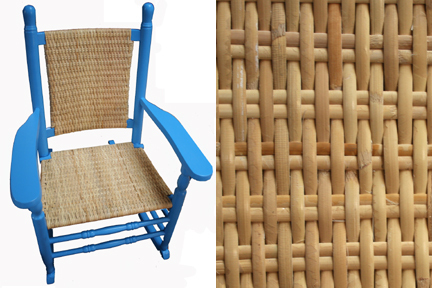 Get this booklet when re-weaving a porch rocker type in plain-weave with 1/4" Wide Binding Cane or narrow flat reeds. Uses three 500' coils for seat and back, or one 500' coil for seat alone.